A few years back I received an album from a group called the Sunny Jain Collective, full of moody Indo-jazz. Really good stuff, but rather cerebral for my tastes, and certainly more likely to appeal to jazz fans than world-music-festival ravers. Now percussionist Jain has pulled a more energetic rabbit out of his dhol. The group Red Baraat combines the party energy of a Punjabi wedding with swinging brass -- similar to the UK's Bollywood Brass Band perhaps, but Red Baraat's explosive energy and acoustic clarity (John Altieri, your sousaphone kills me!) makes me want to jet to New York to see them live. They've gotta be great. For now, though, I'm delighted with this 11-song recording, which includes Indian pop tunes, originals, and Bollywood songs (including the increasingly famous "Dum Maro Dum" done with a killer "George of the Jungle" bass line). 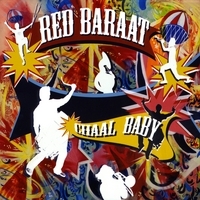 You may not have known you had such a need, but trust me... Red Baraat will fill that dhol-funk-shaped hole in your music collection. Highly recommended.